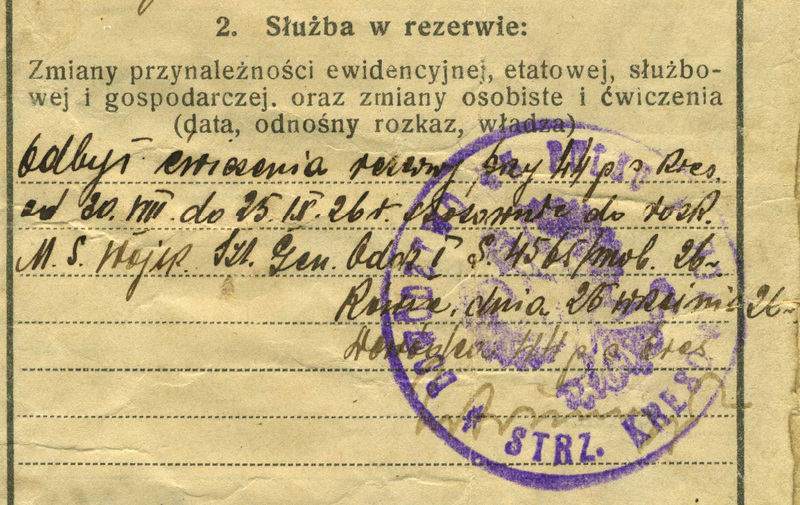 I was looking for some help in filling in some gaps in a translation of a 1925 Polish military book belonging to my Grandfather. There are a few words that I can't make out well enough to write out into a translator. Any assistance is most welcome and appreciated! Odbył ćwiczenia rezerwy przy 44p.s.pres. Odbył ćwiczenia rezerwy przy 44 p.s.kres. M. S. Wojsk. Szt. Gen. Oddz. I S. 4565 mob. 26r. Równe, dnia 25 września 26r. of M. S. Wojsk. Szt. Gen. Oddz. I S. 4565 mob. 26r. Commandor of 44 p.s. kres. The help is much appreciated, also going the extra mile in linking the wikipedia articles! Lots of interesting information. I may not have more than a handful of documents left from him, but this gives me a lot of insight into his life, one that my family never knew about.